Beginning his career with a fundamental curiosity about our bodies and minds and how to promote energy, well-being, and performance, Andrew studied Traditional Chinese Medicine (TCM). These studies established an understanding of an ‘interwoven whole’ between body, mind, and spirit emphasising balance and harmony through awareness and connection. 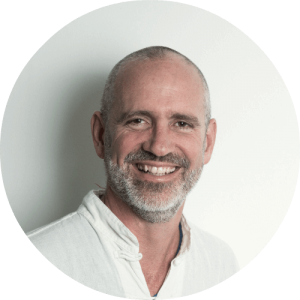 Over the ten years in his TCM practice, Andrew became increasingly interested in how people’s minds and attitudes affected their well-being and performance. Discovering Process Oriented Psychology in the late 80s was a powerful and distinct experience of coming ‘home’. Process Work’s roots in Jung, Daoism, and Shamanism resonated deeply with Andrew and, above all, Process Work provided direct ways to access and experience key concepts in these traditions. Following someone’s process is like following Qi or life-force. After this realisation I learnt more about following Qi from Process Work then I had in the 14 years of working with Chinese Medicine. Study and practice of Process Work continued and deepened Andrew’s understanding of the connections between body, mind, and spirit, creating a greater sense of them together as a whole. Working with people and developing the skills to enter and follow the organic flow of their experience or ‘Process’ was different and more dynamic than just ‘treating’ people in TCM. I enjoyed clients being more active and experiencing their flow versus being in a more passive role where they were being treated. The desire to more freely explore and practice Process Work as a modality led to completing a four-year psychology degree with an additional two years supervised practice in order to become a fully registered and practicing psychologist. Using these qualifications, and driven by an existential quest, Andrew worked for several years with people nearing the end of their lives through terminal illness. Key learnings from being with these people at such a powerful time in their lives were the importance of deep and full-filling relationships with others and one’s own self. The depth of these experience led to nurturing the relationships within his growing family with partner and children. Relationships and nurturing deep connections have assumed prime importance in Andrew’s personal and professional life. He is constantly challenged and inspired by working with couples and long-term relationship issues and regularly teaches his own course – Couple Magic – which helps participants discover renewed intimacy and connection through their disagreements and conflicts. In his busy private practice, Andrew enjoys opportunities to move from the ‘two-dimensional’ space of just sitting and talking to working in a ‘three-dimensional’ space where clients have greater opportunity to explore their experience and access their resources and creativity. Through being able to stand, move, and discover how they position themselves, clients are able to access a freer and deeper space for expression, insight and reflection.